Citizen Curators were invited to participate in this excellent workshop held in the spacious Falmouth Council Chamber. 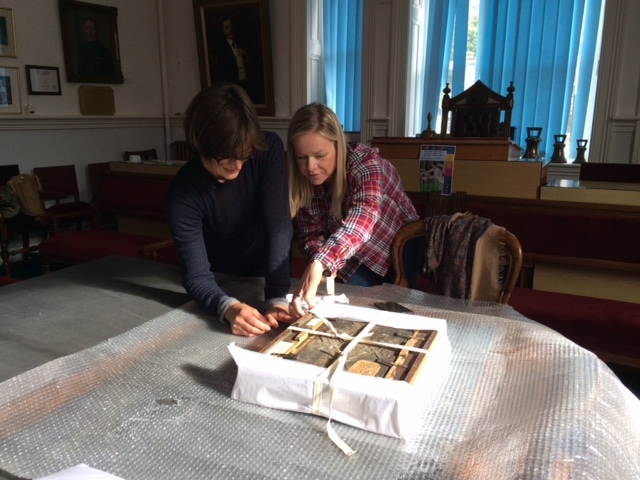 The huge table was laid out with a selection of packing materials and four objects which we were later to wrap, but first Natalie took us through the rules of preparation, teamwork, condition reports, materials, handling and packing. 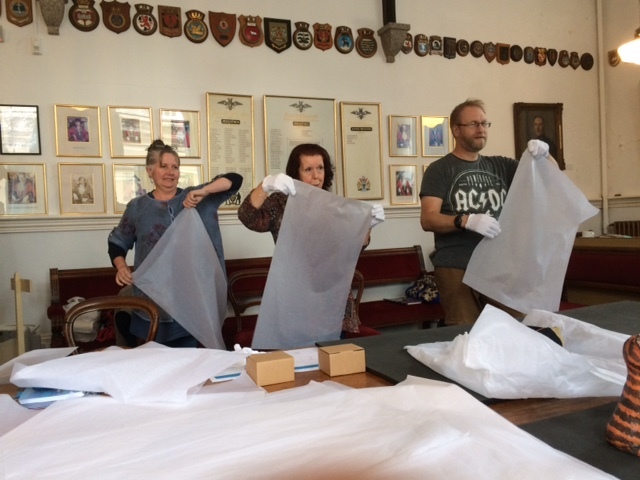 Preparing to move or pack an object requires good planning regarding not only the equipment and materials required, but also aspects of personal dress to avoid damage e.g. by zips, buckles or jewellery. Work must be in a clean environment, with no food or drink. Good communication within the team is essential to avoid accidents – 85% of accidents in museums are down to human error. We had a whole new vocabulary to learn when examining an art work for any damage for a condition report on arrival, moving or departing a gallery. A useful tip was to unpack objects on the white acid free tissue paper, as small chips or paint fragments can be easily seen and saved. All damage must be recorded. Next we discussed the different packing materials and their uses. The acid-free tissue paper comes high on the list of materials that do the least damage to objects. We were taught to make tissue puffs, a particularly useful skill for packing china and items at high risk of damage. 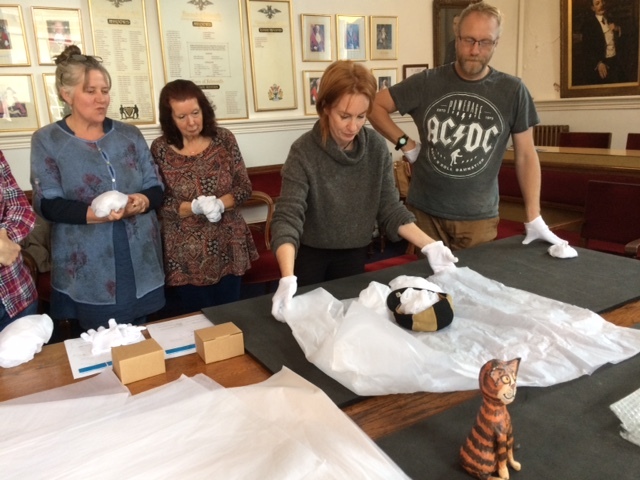 Our team then wrote a condition report and securely packed an object, a piece of sculpture, which ended up looking like a package from a fish and chip shop! 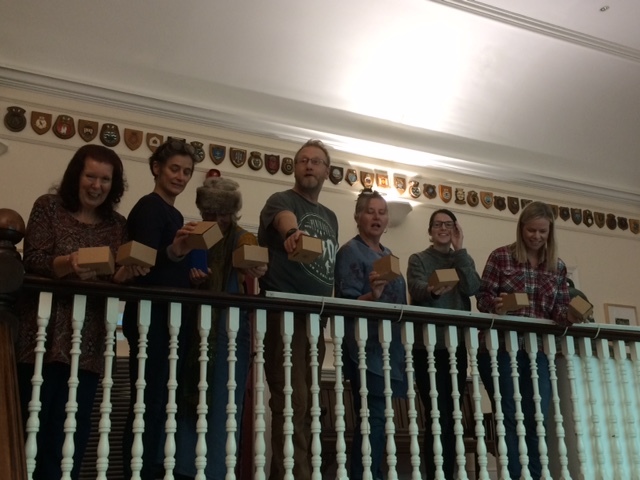 A fun exercise at the end of the day was to pack an egg in a cardboard box and to drop it from the second-floor balcony. Needless to say, as novices most of our eggs were cracked or broken, but congratulations to the two people whose eggs remained whole! Thanks to Natalie for an excellent presentation and teaching us practical and useful skills.